W.B. 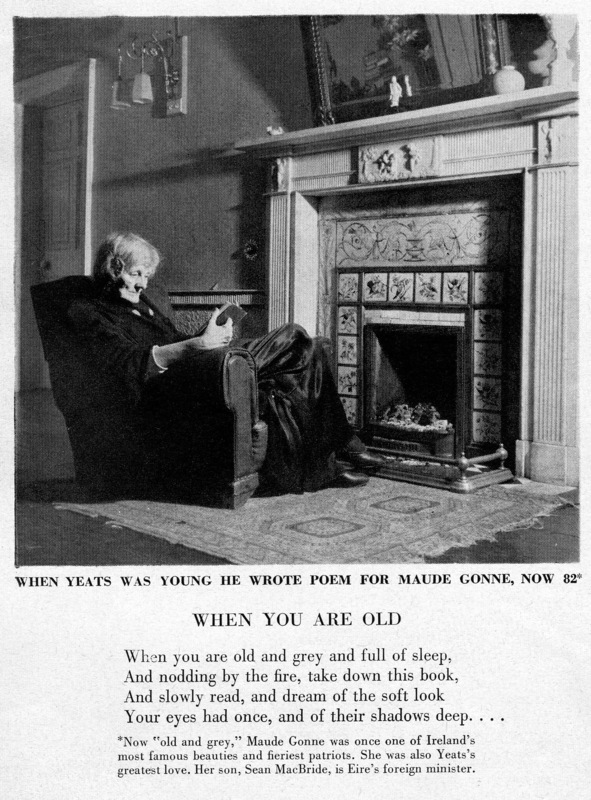 Yeats’ 1891 poem "When You Are Old" is widely considered a commentary on his unrequited lifelong passion for actress, Irish Republican and suffragette Maud Gonne. Yeats first met Gonne in 1889 (a meeting which Yeats was later to describe in his memoirs as the day ‘the troubling of my life began’) and he remained in love with her for much of his life, proposing marriage at least four times. Gonne became his muse, and he drew on his tortured love for her, albeit unnamed, as the inspiration for many of his works, including most notably the poem, "When You Are Old." Although Yeats’s poetry is often very dense and rich in allusion to mythology, the occult and history, in "When You Are Old" the pain and bittersweet nature of a spurned love is all too apparent. Australian playwright Jessica Bellamy drew on the poem and her love of W.B. Yeats’ work when writing the theatre monologue "Little Love," which she then adapted with director Damien Power to create the short film Bat Eyes. Watch it above. In Bat Eyes, Adam and Jenny (‘Bat Eyes’) Barrett are brought together through an incident of classroom bullying. Through the metaphor of visual impairment and an eye examination undergone by an adult Adam, Bellamy and Power explore the poem’s themes of longing, insight, revelation and regret, and poetry's capacity to provide solace and awaken empathy in everyday life. The script of this beautiful short film consists principally of the text of the poem, with the film’s two young leads repeating Yeats’ words back and forth to each other, as the story flips back and forth in time, the meaning of the lines becoming more tangible and resonant with each recitation. ‘Yeats writes about ancient mythology and the history of his time, but you don’t have to understand all that to get the feeling of what he has to say. There are lines, there are moments that, as a reader, you just get and you think: I’m not alone in this world and that someone else has felt these things as well. I hope viewers will hear the truth of what this poem is saying, and that they’ll see the film as an ode to love, relationships and to poetry itself. Gonne, who died in 1953, outlived Yeats by 14 years. She was photographed by Life magazine in October 1948, old and grey, sitting by a fire and reading Yeats poetry. And read and listen to the text of "When You Are Old" here. There's also a version read by Colin Farrell. Find it below. Dan Prichard is an online film and webseries producer, based in Sydney, whose work explores identity, place, and the space between film and performance in the digital arena. Visit his website here. And a lovely way to start my Monday and my week. I’d been researching the theme of memory, with thoughts especially of love and loss. This gorgeous film has moved me to the brink of tears and filled me with something beautiful and sad. I’ve been moving through the barren landscape of a long and fruitful mariage that has lsowly withered…because of everything that life has thrown at it, and because my husband and I have lost sight of each other. Yeats’ poem has reminded me that there is another path, and another way of seeing. The possibilities of youth–and the wasting of these– cause me occasional pain, but not bitterness.